The dual suns that rise and set over Luke Skywalker's homeworld in the film Star Wars may be more than just fantasy, according to data from Nasa. In a classic scene from the 1977 movie, the hero gazes into the distance as two yellow suns set on the horizon. Nasa's Spitzer Space Telescope has found that planetary systems are as common around double stars as they are around single stars, like our own Sun. Details of the research have been published in the Astrophysical Journal. In the study, a team of researchers used an infrared camera on the Spitzer telescope to search for dusty discs around binary, or double, stars. Dusty discs are made from the leftover debris of planet formation. "We knew the stars would be there, the question was whether there was a planet to be the place where you could stand and see these sunsets," said Karl Stapelfeldt, a scientist at Nasa's Jet Propulsion Laboratory (JPL) in Pasadena, California. "The inference is getting stronger now that there must be such planets based on what Spitzer has found." The presence of planets in dusty discs is thought likely, but is by no means certain. "In our Solar System, asteroids collide with each other and produce showers of dust and that is, we assume, what we're seeing in these other discs - the dust produced by the collision of two bigger bodies," lead author David Trilling, from the University of Arizona, told BBC News. "We can infer that there are bigger bodies like asteroids. The next logical leap is that if there are processes that formed these bigger bodies like asteroids, those same processes may also have formed planets." The team looked for dusty discs in 69 binary systems between about 50 and 200 light-years away from Earth. The data show that about 40% of double systems had dusty discs - slightly higher than the frequency for a similar sample of single stars. This finding suggests that planetary systems are at least as common around these binary stars as they are around single stars like our Sun. In systems where stars are 50-500 astronomical units (50-500 times the distance from the Earth to the Sun) apart, dusty discs circle one of the pairs of stars. 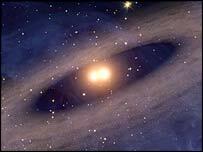 But the researchers found no discs in binary systems where stars were 3-50 astronomical units (AU) apart. In these double systems, Dr Trilling suggests, gravitational forces may kick debris out into deep space, preventing the formation of planets. When the team looked at even more closely spaced binary stars - positioned at three to zero astronomical units distance - they were surprised to find that dusty discs were common, occurring in about 60% of cases. In these systems, a dusty disc circles both stars, rather than just one. Any planets orbiting these close-knit star systems would experience sunsets similar to the one depicted on the fictional desert world of Tatooine in Star Wars: Episode IV - A New Hope. "The number of potential sites for planets has just increased enormously, because now we know these multiple star systems may be commonly associated with planetary formation," said Dr Trilling. Dr Trilling said that if planets did exist in dusty discs around these binaries, they might be at distances where the conditions could be hospitable for life. "The Luke Skywalker picture is science fiction. But I don't see anything that's astronomically incorrect about it," said the University of Arizona researcher. "With some of our systems, you could play with the geometry, put a planet there, get the temperatures right and make it look just like [Tatooine]." "Of course, we don't know anything about planets in these systems - it's all imagination - but it looks fine."